The required paperwork and the cost to enter Peru will greatly depend on your nationality. You should also bear in mind visa renewal requests are commonly rejected. On a tourist visa the maximum stay is 90 or 183 days and tourist visa holders are forbidden to work, though you can look for a job with a tourist visa. 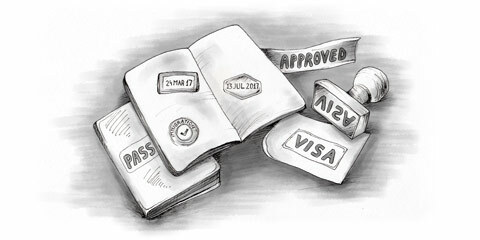 If you are in Peru on a tourist visa, since 2006, all renewals made within the country will be rejected. So make sure when you enter you receive a visa that covers your intended stay. Travellers should have a return or onward ticket already booked before entering the country, as many international airlines will demand to see proof of leaving Peru in order for you to board in the first place. Thus it is worth checking the conditions of your airline before boarding. Citizens of countries that are listed below will not need to apply for visa in order to enter Peru. A tourist visa will be issued upon arrival however your passport will need to be valid at least 6 months longer than your entry date. Ask at the immigration desk for the full 183 days permitted for a tourist visa, the length of visa you receive is ultimately at the discretion of the immigration officer. If you come to Peru without a visa as your country does not require it, you will not be expected to pay visa fees when you receive your visa upon entrance. United States, Canada, most Central American Countries, all South American Countries, all countries within the European Union (including Switzerland), Australia, New Zealand, Brunei, Indonesia, Japan, Philippines, Laos, Israel, Thailand and Singapore. On airlines to Peru you will be handed a document called a TAM (Tarjeta Andina de Migración). It is a form, available in both Spanish and English, and once you have filled out your personal data upon arrival you will hand it in along with your passport at the immigration desk. If you overstay on your visa you will be expected to pay a fine of US$1 per overstayed day.